» Iowa: Too much hoopla and weight! Iowa: Too much hoopla and weight! Excitement on the screen: Is it really warranted? Look, I’m sure there are a lot of nice people in Iowa, and many of them probably also know what they are doing most of the time. But am I the only one who is not all that impressed with the outcomes of the Democratic and Republican caucuses there on Monday? Why do the media and especially the cable channels treat this event like the Second Coming, spending months building it up and then devoting all of Monday night to the results? Is it really that important what a segment of Iowans prefer? The results had Cruz, Trump and Rubio leading the Republican contenders in that order, and Clinton and Sanders pretty much in a dead heat on the other side. So these are supposed to be the best people we have in the running for president? Others who are better qualified finished far out of the running. They include Kasich, Bush and Christie, present or former governors of states with many of the challenges facing the country as a whole. But their experience got them nothing. Instead, the caucus attenders in Iowa went for the speech makers. The two senators, especially Rubio, say many right things, but have they ever had to do any governing on a big scale? And Trump? Not only has he never tried to preside over an unruly government representing lots of different people. But then he trumpets wild statements that get him heard, especially on television, which likes celebrities, but are so unmoored from reality they can’t possibly be carried out. Too bad the Oregon primary in May comes too late to do any good in the presidential race. We ought to think about holding it in January in presidential election years. Then we would get to see and hear the candidates in person, and the outcome would be determined by an actual counting of secret ballots. Do you suppose Iowa Republicans voted for Cruz because he wants to end the Federal corn-ethanol crap? Too bad there’s little else I like about him. I could try voting Republican if it weren’t for their now-almost-unanimous religious and social-conservative attitudes (and platitudes), and consequent likely appointments to the Supreme Court, which will sail through the Senate. No, I don’t want to force really small, “Christian” businesses to bake cakes for anyone they feel is unworthy, but I do believe in Federally-recognized marriage equality (“evolved,” just like Obama). Christie and Rubio have made noises about ending state experiments in more-rational drug policy. Another example that contemporary conservatism (like liberalism) may be more about affiliation than principles. Another thing bothers me about Republican attitudes: the tendency to want to privatize the public domain. A recent local example was the attempt by farmers to buy from Benton County, far too cheaply, adjoining land from the Bailey Branch Line, a move supported by an unsuccessful Republican County-Commission candidate. At the risk of sounding trite, once it’s gone, it’s gone forever – no bike path to Eugene, no future rail service someday when oil is no longer cheap. There’s something similar afoot on the John Wayne Pioneer Trail in Washington (just heard about it, that’s all I know). I don’t think any political “machine, party, PAC or candidate” has done much real good for our country. The “power” is acquired, the position is set & then comes the maneuvering to stay in place for 10, 20, 30 years of more of the same. This election & its supportive systems are set to take this country on a real drop out, turn on “trip” in ’16……say, Is Dr Leary really a candidate for anything this year…:) :)??!! I fully agree that the cable tv media was bonkers yesterday. So I spent the evening waiting to see Donald Trump instantly change into a woman on a live TV feed, or Bernie Sanders say he just took a job with Goldman Sacks and was quitting. So, the fluff-meisters filled the air with much about nothing, while a small group with large egos jostled to out-tweet each other like children. At least the first public step in this election round is in the can. Pleased to see that Sanders and Rubio did well. Interesting that the parties have changed demeanor. The Dems were once a rowdy crowd with many potential candidates while the Reps were reserved and polite. Not so much now. Yesterday Judy Woodruff did a piece on the state of the Republican party through interviews. A very interesting piece. 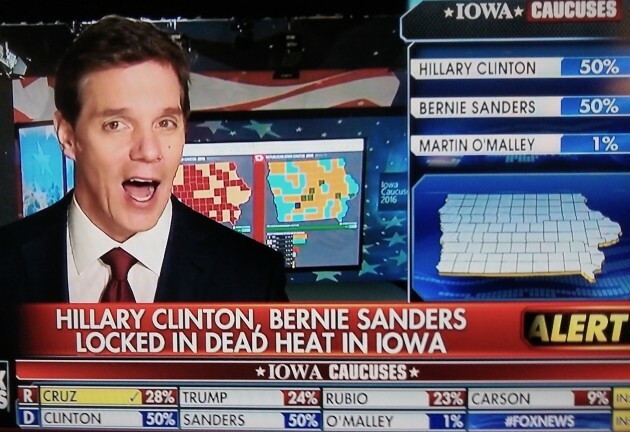 YA know, I never really understood how this “primary” vote thing went in Iowa. My good buddy from Oregon moved back there near Des Moines and he explained it to me. You go down to a school gym (or some other meeting hall) and listen to people give a 3 minute speech about why you should vote for their candidate. Then blank 3×5 cards are passed out and you write the candidates name you select to “vote” for on it and pass the card to the end of the row you are sitting in. I don’t know if you have to be registered to vote to enter the room. I suppose you’d have to registered in the appropriate party. The process amazed me. I find it to be very helpful when watching news programs to turn off the sound and use the closed captions. That way I can easily ignore the silly noise of so many talking heads – of course sports programs are the same way. Most of the “news” people have no clue about the frustration and anger with politicians for putting their ambition and vanity ahead of their responsibility to the people – particularly those who live in “flyover country”. They are then clearly confounded by results such as the Iowa caucuses.